In 2012, Scotland hosted the Home Internationals at the end of June in Dundee, welcoming Wales for the first time in the Over 65 competition. The World Cup was held in Oxford in August and the international squads finished off the year in Largs, where they played Wales in the Celtic Cup. Scotland also prepared for the World Cup by taking teams to Bra, Italy in June. Injuries and illness forced plans to field a Scotland Over 70s team in the World Cup but a team with some underage and guest players played the England Over 70 squad in Durham in May and, with some reinforcements, played as part of the Northstars team in the Tournament Trophy at the World Cup. Scottish Thistles once more took part in the LUC Ronchin tournament in March, along with fixtures closer to home against Waverley Inveresk Trinity in February and Friends of Western in September. In the 15th Euroluc Supérvéterans tournament in Lille on 10-11 March 2012, Scottish Thistles qualified in second place in their group after wins against France and Zestigplussers and a defeat against Wales. In the play offs, they were not so successful, losing 3-0 to England LX and being narrowly pipped for third place by Wales who scored the only goal of a tight encounter. Scotland Over 70s (and some Over 65s) took on the England Over 70s squad at Durham University on Thursday 31 May 2012. The thirteen man squad put up a great performance against a very strong England squad in the first half, which was goalless. An injury to centre back Ally Philip just before half time was to prove fatal and the English ran in four goals without reply in the second half. Scotland Over 60s used the European Superveterans Trophy in Bra, Italy from 5 to 10 June 2012 to help them build a new style of play and this, along with the fact that players were just beginning to get to know each other, made results largely irrelevant. Good performances against the better sides were offset by disappointing play against teams they would have been expected to beat, but Scotland signed off in emphatic style with an 11-0 win against Egypt. While the opposition was far from strong, Scotland at last started to play a brand of hockey which boded well for the more important Home Internationals and World Cup to follow over the summer. Scotland Over 65s were robbed of at least a draw in their last match, against Italy, and ended the tournament with no points and no goals. Morrice had turned a Bryce hit from a short corner into the Italian net with ten minutes left, and the officiating umpire had signalled a goal. No one, including the opposition, could explain the decision, prompted by the second umpire, to change the award to a sixteen yard hit. Scotland's misery was compounded when a loose ball was deflected past Black to give Italy an undeserved victory and leave Scotland with no points and no goals in the tournament. England Over 60s retained the Linburn Trophy for Over 60s in the Home Internationals at Dalnacraig, Dundee on 29 June - 1 July 2012 with emphatic wins against Wales by 5-0 and against Scotland by 6-0. In the final match of the competition, Wales ran out 3-1 winners against Scotland and claimed second place for the second year running. In the Over 65s tournament, in which Wales were competing for the first time, England again retained the trophy with even more emphatic wins against Wales by 10-0 and Scotland by 7-0. The match between Scotland and Wales having ended in a 1-1 draw, second place went to Scotland on goal difference. 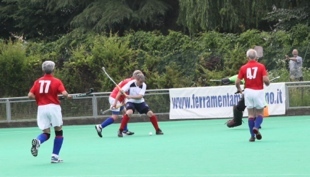 Both Scotland Over 60s and Over 65s finished bottom in the WGMA World Cup in Oxford from 14-24 August 2012. The Over 60s had to wait until their final match before recording any points, while the Over 65s had one win and two draws - still not enough to keep them out of last place. Hit by a series of player withdrawals through illness and injury, the Scotland Over 70s side was forced to withdraw from the 2012 WGMA Senior Grand Masters World Cup in Oxford in August 2012.The players who are left formed the nucleus of the Northstars team in the Senior Grand Masters Tournament Trophy, captained by Doug Morrice. Other Scottish players were George Black, Alan Bremner, Don Paterson, Ernie di Rollo, plus Chris Parker who is almost a Scot coutesy of his flat in St Andrews. Two defeats by 3-0 to Southern Cross and no-score draws against Alliance and England LX left them in third place in the competition after four matches. Another 0-0 result against England LX left them needing a similar score against Alliance to claim third place, and they were on target to achieve that until Alliance scored in the 65th minute of their last match to condemn Northstars to last place. Scotland ended 2012 on a high note by winning both the Over 60 and the Over 65 Celtic Cups on Saturday 27 October at Inverclyde National Sports Centre. Scotland Over 60s had a convincing 2-0 victory with goals from Bishop and Paton, while it took a last minute goal from Weir to give Scotland victory in the Over 65 Celtic Cup after Crichton's early goal was nullified by Maas for Wales.